eMarketer and others have brought to light the concept of view-through conversion. This is essentially when users see an online ad but do not click on it, only to search for the product, brand or service that they saw in the ad at a later time. This can be accomplished by entering the company URL directly into the browser bar, a search through a search engine, or even through social sites. Lately this idea has been getting some attention, and it holds significance for affiliates and website owners. While the ad might not get clicked, it still leaves an impression and delivers key information to users for later use. What this means is that the ad is a starting touch point, but certainly not the end. It also means that the ad itself needs to leave an impression and facilitate further information gathering. As an affiliate it's critical that your advertisement doesn't just drive a search for the product you sell, but a search to buy that product on your website. To the right are two separate ads found by searching on Google. The top ad was found after searching "sunglasses." As you can see, the ad delivers several specific pieces of information -- Designer sunglasses, plenty of choices, a big discount and free shipping. This might be attractive to a shopper, but the brand and the website are mentioned only at the bottom of the ad. A user might now be compelled to search for cheap designer sunglasses because that's the key message. However, they might not remember the vendor, as it is the last piece of information they see. 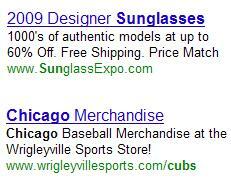 The second ad resulted from a search for "Chicago Cubs." Here, the user sees an option for Chicago Baseball Merchandise as well as the vendor. Now a search might be sparked with the vendor in mind, as it's a key component of the ad copy. The website URL further enhances the brand to the user. Now look at the display ad to the right. Here, the user is presented with several key pieces of information including; the size (24') of the swimming pool for sale, that it is above-ground and the price. However, the company (Bradbury's Waterin' Hole) is listed below everything else. This could result in a user thinking about and searching for a large, above-ground swimming pool for about $2,000, but not necessarily remember that the offer came from Bradbury's. If the business was to be mentioned higher in the ad, a user might start their search with "Bradbury's Swimming Pools." Make sure any images in an ad not only show the product, but include your website's logo and/or URL in a highly visible manner. Any copy should include your brand or website early in the text. For example, if you're promoting a Canon digital camera at a 10 percent discount, make sure your ad copy reads something like this: "Canon Digital Cameras at yoursite.com - 10% off." Here, the user sees the product they want first (Canon Digital Camera), your URL second, and the discount third. The first two items are immediately connected and therefore stand a better chance of being remembered and searched together. Optimize your landing pages with keywords from the ad. Many users simply don't trust online ads and don't like to click them. But they feel very comfortable searching through Google, Yahoo or Bing to find a product, even if they are using the language directly from your ad (especially if it's memorable). So make sure to optimize those pages with terms from your killer ad copy.